Hugo Boss Boss Number One is so attractiveness and sexuality. 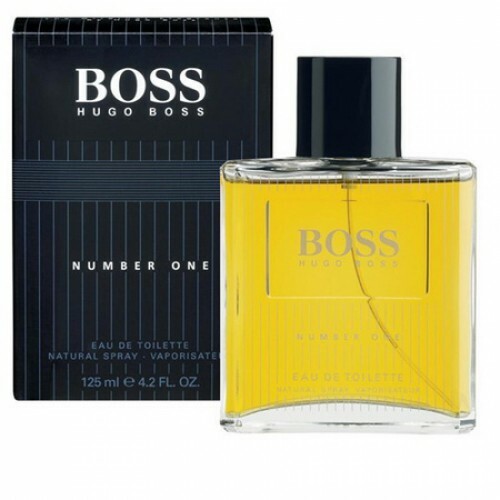 Hugo Boss Boss Number One 125ml. Eau De Toilette - When he's around, you're literally melts from its charm, attractiveness and sexuality. He is one of those who turn followed who admire who are jealous. Its elegant complement to the notes of refined, sometimes unpredictable fragrance Hugo Boss Number One. Created for those who are used to winning at a glance, who does not know obstacles in its path, this sensual fragrance emphasizes courage, brutality and unbridled energy of those around you. The initial note perfume presented a kaleidoscope of colors artfully Beat. Tart Artemisia bitter, sweet basil, bergamot bright successfully connected with fruit accords of grapefruit, green apple, lemon, juniper and thyme complemented. Heart note built around viscous fragrant honey, fragrant geranium, jasmine, lavender, lily of the valley, rose, connected with the root of the iris and sage. Rich end note, presented amber, white cedar, oak moss, cinnamon, musk, patchouli, sandalwood and tobacco, expresses solidity, presentable fragrance. Eau de Toilette Hugo Boss Number One - a fragrance for those who do not doubt that he is the best!